Woops... Forgot to check the box making it public. Ok, it should be open now for testing. Update: I did some test carves using the app over the weekend on my x-carve. I tweaked a few things with the way it inflates the branch widths and updates your original shape. I think it's getting closer to the point where it could replace the original app, but it would be nice if some other folks could test it out and report their experiences first. I'll try and do some testing. I have used some of these add on apps but found zero documentation on functions and settings. Where do I get that? We don't really have any good documentation for the apps yet, although some are documented to some extent on the forum. Was there any app in particular you had a question about? well for starters, the circular text app doesn't have a lot of insight on correcting errors and doesn't allow editing later if you want to change the radius. it seems to change the position of all the letters while at the same time, going back to default settings. frustrating! The offset app looks interesting but again, no real idea of what each setting does. So best practice from an IT perspective is document as you go and at least put in some readme file for the next guy. since we can't see or edit your coding, a flat help file would be nice. doesn't allow editing later if you want to change the radius. it seems to change the position of all the letters while at the same time, going back to default settings. frustrating! Yes, that is frustrating. We have some stuff in the works to integrate apps more with the core Easel design experience. It's very early in the development process, but this is something we are aware of and working on. In terms of documentation, we will try to do better in that area as well. How can one get this to test Bill? @CharlesRoseberry I've made the source code available here. To actually use it inside of Easel, you just need to request developer access. Thanks You sir. Great addition. Read the application for dev access. I am not a developer so I suppose this means I can not request access to that functionality. Thank You for the insight however Bill. I hope this gets added at some point. 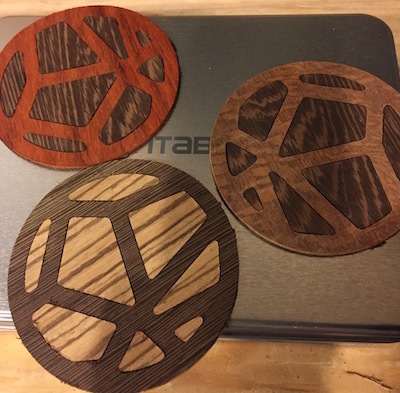 Had a chance to do a little carving today, and made these coasters. The app seems to be working pretty well, so I've merged it into the original voronoi app and turned off the beta version of the app. when you say combining the voronoi and inlay, do you mean you used the voronoi first, then selected all of the inside pieces and then the inlay? I used the Voronoi app with the "fill branches" option. With that option, it gets imported as a single fill object. So I only had one shape to select for the inlay app. "De eigenschap of methode hypot wordt niet ondersteund door dit object" which means as much that a (library?) function HYPOT is not loaded or recognized..
BTW í'm using Windows 10. I was using InternetExplorer but in Chrome it works.. So, problem solved.. I found this forum because I’ve been searching a lot for Voronoi. I find your app very exciting, but honestly I have not understood what I have to do to test it and what I need for basic software? I’m not sure I understand your question. Are you doing 3D carving, or just looking for a general purpose voronoi generator?